Within every heartfelt goodbye lies underneath it the potential of a promising hello. That happens to be the case with the Inspiron Gaming line from Dell. Dell seems to be going for style with their most recent gaming laptop products. 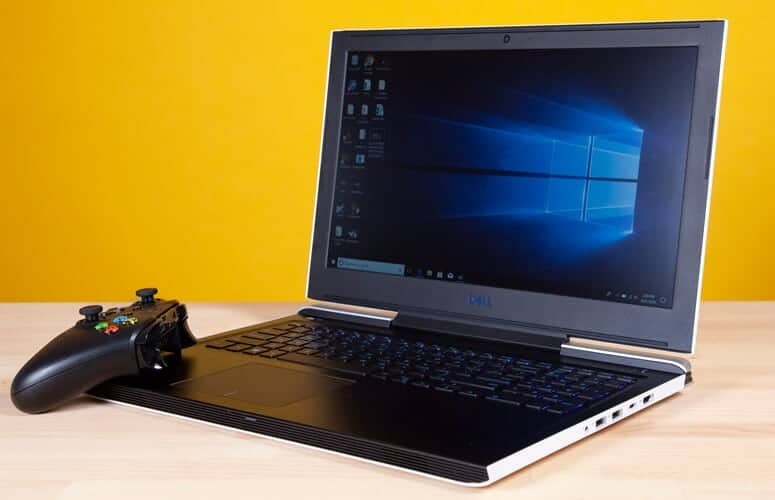 The Dell G7 15 Laptop is a sleek machine with a stylish white and blue color scheme accompanied by a GTX Nvidia GeForce 1060 Max-Q processor. Oh, and for strong performance, an Intel Core (i7-8750H) is what it uses. 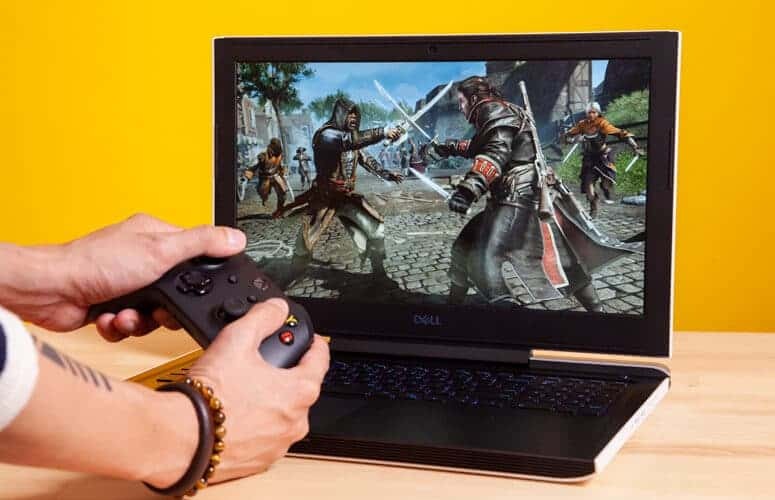 Dell recently phased out their entry level gaming-laptop brands for something a little more powerful as well as exciting. Branding a sports-car-like look and design completely fitted with an eye-catching color scheme, the new G7 laptop looks like nothing this company has ever made before. However, beyond its dashing new looks, you get specifications capable of providing a solid midlevel gaming experience accompanied by loud audio. Unfortunately, it still has some very noticeable downsides. One of them being its dim display screen. The other is that it happens to have a rather shallow keyboard in our opinion. Besides that, it’s definitely a gaming laptop worth any gamer’s consideration. One thing’s for sure, this new machine from Dell is a mighty handsome device. Yeah, it’s a bit on the chunky side, but the sports-car aesthetic it has going on is super awesome. The new alpine white unit (but you can get in black too if you want) has a silver hinge wrapping around accompanied by a shiny blue Dell logo. Considering the fact of how many gaming laptop devices come in a black and red color scheme, The G7 from Dell is kind of refreshing. At its back end is located some black ventilation systems with blue fans inside. Now, if that isn’t cool then we don’t know what is. The 1080p 15.6-inch IPS display screen is probably the G7s greatest downside. Not only is it bland but it’s also dim as well. Media and games don’t stand out as much as they should. When watching video content you’ll probably find yourself pounding away at the F12 button trying to brighten up the screen. Sadly, all this will be in vain. Largely because that certainly will not make the display more luminous. 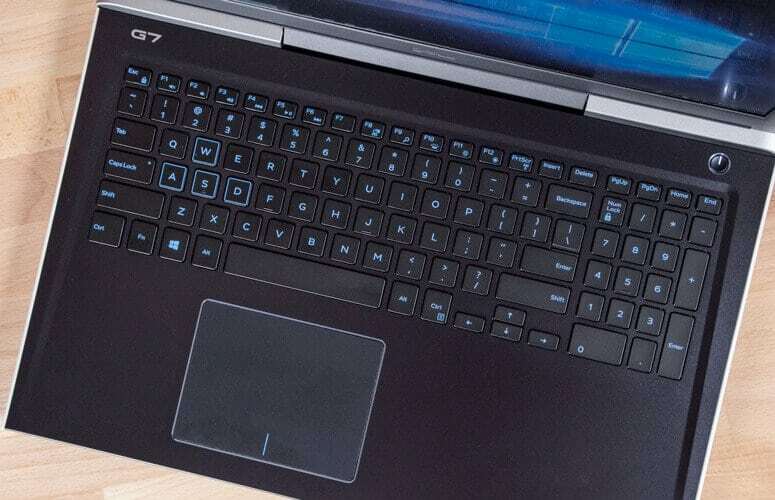 The G7 fails to deliver on the color gamut test and has the ability to reproduce only about 62% of the sRGB which happens to be way below the gaming laptops average percentage of 106 percent. The Helios as well as GV62, which are its main competitors, all recorded much better result. But, it doesn’t stop there. The display screen also lets down in brightness tests as well, recording a brightness level of 232 nits. That also happens to be way below the mainstream gaming laptop average of 296 nits. In our opinion, we think Dell could’ve added a little more substance in the G7s keyboard. It is rather on the shallow side if you ask me, with its keys offering between 0.8 and 1.1 millimeters of travel. The force required for the keys to press down is around 62 grams. Fortunately, if you happen to be a keyboard ninja and a fast typist, then this shouldn’t slow you down much. The 3.1×4.1-inch Windows precision touchpad is spacious, smooth and nice. It responds instantly to 2-finger scrolling as well as switching between desktops using the 4-finger swipes. The Dell G7’s i7-8750H Intel Core processor accompanied by 16GB of RAM gives the device the ability to act like a complete multitasker. You can seamlessly stream video content from Netflix and so on while running a few Twitch streams with more than ten tabs open on Google Chrome. All this can be done without having to stress the machine too much. On Geekbench 4, the Dell G7 15 laptop continues to impress with an overall test performance whereby the system reached a peak of 19,516. Concerning battery life, Alienware and Dell, in general, are the brands that usually provide the best results when it comes to gaming laptop machines. 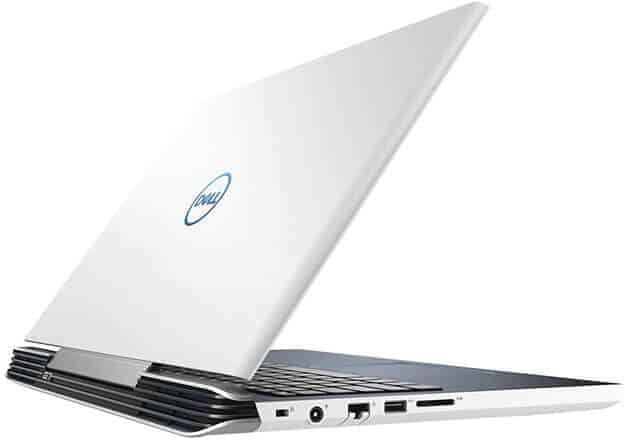 Fortunately for us, the G7 Dell is no exception to this and offers superb battery life capability. In the Laptop Mag battery performance test, the machine lasted for about five and a half hours. This is normally not bad at all. The time recorded was enough to blow past the 3:49 mainstream gaming average. It also topples the GV62’s 2:06 as well as PowerSpec’s 4 hours. Bottom line, the new Dell G7 15 laptop is basically an emphatic foot forward into the future while still managing to maintain and keep the few good lessons they’ve learned from the past. Aesthetically speaking, this new G series brand from Dell looks like it’s fashioned from a different cloth when you compare it to its other counterpart brands such as the Alienware as well as Inspiron. This kind of gives this gaming laptop its very own identity, which is pretty cool. Oh, and by now you should know the Gadget Gang is never wrong when it comes to such things. We know what you’ve got to get your hands on. With that being said, for its price, this gaming device certainly delivers. Absolutely worth its salt. The Dell G7 15 is a great piece of kit! Dell have definitely delivered a better model of the G7. Here at GadgetGang we were a bit let down by its screen quality however its performance gives it the edge is needs! Check out our full review here. Next articleWhy Email Marketing Is Not Dead In 2019… Or is it?